So cute and what a great capture! Looks like you have a future soccer player on your hands!! Precious!! Happy Thanksgiving to you! have you discovered any fun new Southern T-giving treats? Some people fry turkeys down here (not me!) Dressing or stuffing?? Have a good one! What a cutie! 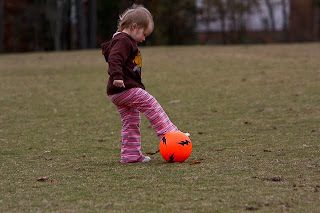 She is really concentrating on those skills - maybe she will go pro one day! Great action shot. Cute! Happy WW! Thanks, everyone. A friend captured this shot this past weekend, and I'm so grateful, because she seriously looks intent on REALLY playing that ball, it just cracks me up! Great action photo ... makes me want to yell out G-O-A-L!! Happy WW and Thanksgiving to you! She's darling! What a great shot!